I’m one of those crazy lotion ladies. You know, the ones who have a bathroom closet full of various lotions that range from being full to half full. I tend to get bored with scents very easily, and I move on to the next new heavenly scent that catches my eye (or nose, in this case). Previously, I was obsessed with anything and everything strawberry. If it had strawberry in the lotion title, it was or still is in my bathroom closet. Currently, my favorite scent is lavender. It’s so soothing and relaxing! I hope I don’t grow tired of this lovely scent because it’s aroma is simply perfect. 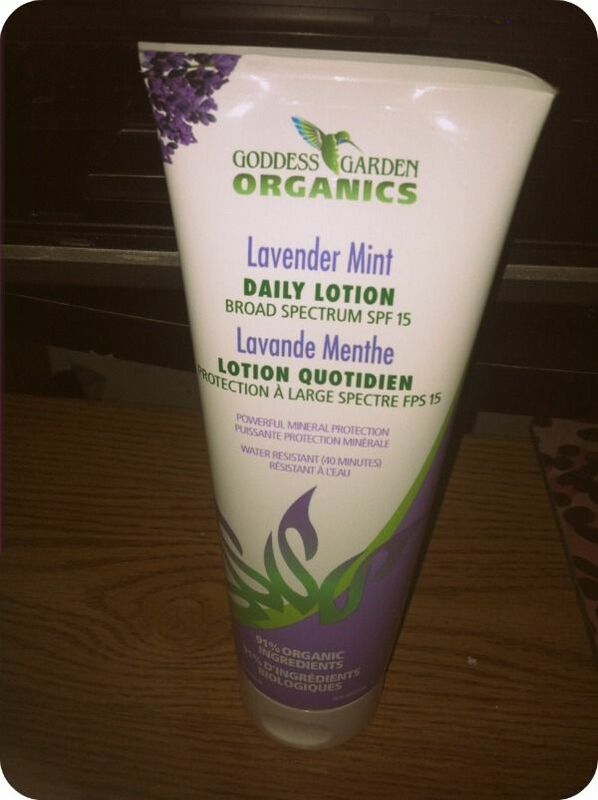 I received an 8oz tube of Goddess Garden Organics’ Lavender Mint Daily Lotion to review. Oh my word, this stuff smells AMAZING!! I cannot stress that enough. I’ve become totally enamored with the scent of lavender, and when it’s combined with mint…only great (smelling) things can happen. The Lavender Mint Daily Lotion has multiple uses, including preventing sunburns, decreasing the risk of skin cancer and early skin aging. It provides broad spectrum SPF 15 protection and is water resistant for up to 40 minutes. Additionally, I found that this daily lotion makes my skin feel supple and super soft. After applying this non-greasy lotion onto my hands and arms, I could go out and not be afraid for someone to touch my once dry hands. What I love the most about Goddess Garden Organics’ Lavender Mint Daily Lotion is that it contains 91% organic ingredients. The daily lotion is free of chemical sunscreens and is non-GMO. My skin is quite sensitive, and I only prefer to use the safest ingredients on my skin. I noticed no irritation after applying the lotion onto my skin. Every time I step outside and into the sun, I make sure to apply the Lavender Mint Daily Lotion approximately 15 minutes before I step out of the door. It’s advised to reapply every 40 minutes after swimming or sweating to ensure the ultimate protection against sun damage. Also, I would recommend reapplying immediately after drying yourself off with a towel and at the very least…every 2 hours. It’s best to stay out of the sun between the hours of 10AM and 2PM, when it’s the brightest and hottest. You can purchase the Lavender Mint Daily Lotion from Goddess Garden Organics’ for $18.99! Stay connected with Goddess Garden Organics via Facebook, Twitter and Pinterest. Open to the US only. Please allow 4-6 weeks for delivery. I’d love to try the Tangerine Lavender scent! Having a family of girls and granddaughters who all have sun sensitive skin, this product would be great for my purse to share. I would like to try the Natural facial Sunscreen. The grapefruit bergamot lotion caught my eye. I really love citrus scents. Thanks! I think if I couldn’t have the Lavender Mint Lotion I would get the Tangerine Lavender Every Day Lotion! Sounds so wonderful! I like the Natural Daily Lotion and also the sunscreen. The tangerine lavender scent sounds wonderful. Besides the lotion, I would be interested in trying the kids natural sunscreen spray, I think it would be easier to apply than regular sunscreen. BABY NATURAL SUNSCREEN SPF 30 – 3.4OZ also catches my eye. I like the tangerine lavender daily lotion. I would love to try the Natural Sunscreen Spray SPF 30. 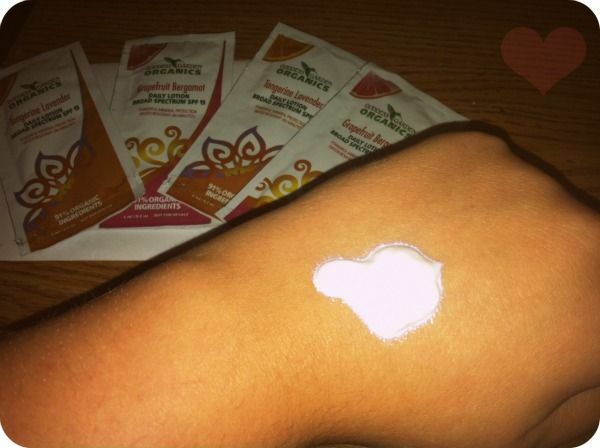 I would love to try the kids natural sunscreen! I’d like to try the Natural Sunscreen Continuous Spray. I like the Natural Facial Sunscreen SPF30 – 3.4OZ! I’d like to try the Sunscreen Spray. The sunscreen looks like a great one! i wouldnt mind trying the Sunscreen Spray. I saw a lot of good stuff. First I want to try the Grapefruit Bergamot lotion. I like the spray bottle version of the natural sunscreen… I hate aerosols! I would like to try the Natural Facial Sunscreen SPF30. grapefruit bergamot lotion caught my eye. I’d love the Lavender Mint body lotion. I would like to try the NATURAL FACIAL SUNSCREEN SPF30 – 3.4OZ!! Kids Natural Sunscreen Spray SPF30 .